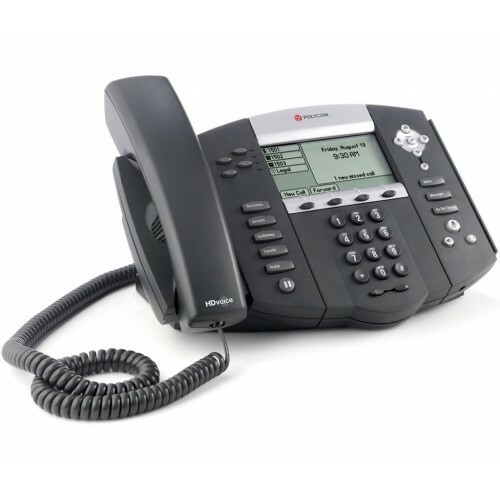 Offering a range of advanced features, including a backlit greyscale LCD screen, this executive phone from Polycom is expandable with up to three additional modules, and it is fully interoperable with all leading SIP-based IP PBX and Softswitch telephony platforms. Offering enhanced productivity and easier deployment and maintenance, the Polycom SoundPoint IP 650 is also a pleasure to use. It also features a six-line interface which may be expanded to 12 lines with the addition of the SoundPoint IP Expansion Module. The Polycom SoundPoint IP 650 features high-definition audio thanks to the greater bandwidth afforded by Web-based telephony systems, and it also deploys Polycom's Acoustic Clarity Technology and a G.722 wideband audio codec. Versatile and expandable, the Polycom SoundPoint IP 650 is a perfect choice for growing communications departments needing reliable telephony hardware. good solid phone simple to use, very happy with it.